This project addressed the needs of Soviet Jews intent on learning Hebrew. Resurgence of interest in Hebrew was two fold. First, it was a connection with ones Jewish roots — Hebrew is the language of Jewish liturgy and the Bible. Second, for those whose goal was aliyah (immigration to Israel), fluency in Hebrew would speed integration into Israeli society. Beginning in the late 1960s, non-official groups were formed and classes held in private homes. I became aware of this activity in 1971, in telephone conversations with Soviet Jewish activists. Subsequently, Project Sefer was set up to meet the various needs of the Hebrew learning groups throughout the Soviet Union. Lastly, I want to mention two special undertakings that peculiarly benefited from the talents and enthusiasm of Cleveland Jewish educators and institutions. 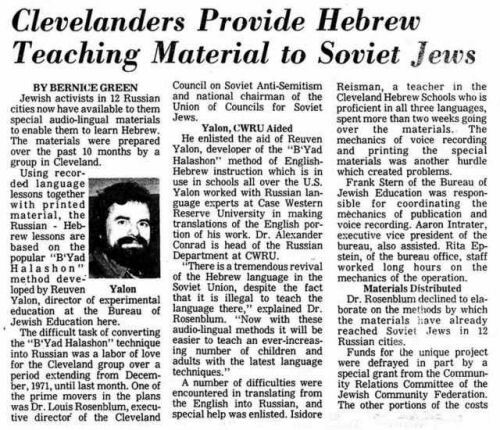 The first enterprise, begun in December 1971, in association with Reuven Yalon of the Cleveland Bureau of Jewish Education (CBJE), was the preparation of special recorded language tapes and material for the self-study of Hebrew for Russian speakers. Other individuals also volunteered their help: Dr. Alexander Conrad, head of the Russian Department at Case Western Reserve University; Isadore Reisman, of the Cleveland Hebrew Schools; and Aaron Intrater, Rita Epstein and Frank Stern of the CBJE. The CJCF provided a grant to defray part of the material expenses not covered by the CCSA. Ten months later, the job was completed and I arranged for copies of the tapes and an associated study book to be channeled to Hebrew study groups in 12 cities in the USSR. The second of the special undertakings was in direct support of the teachers. Soviet authorities long regarded the study of Hebrew with great suspicion — teachers were harassed and Hebrew books confiscated. When this failed to dampen Hebrew language studies, the government announced that teaching without certification was illegal. In January 1973, my Soviet Jewish contacts suggested it would be useful for a representative of an internationally recognized Hebrew training institution to visit the USSR and certify Hebrew teachers. Soon after, I met with Henry Margolis, Director of the CBJE, filled him in on the situation, and discussed the part he could play in the unfolding Jewish drama in the USSR. Henry understood, and what’s more, was eager to take part. With the help of his staff, a standard teacher’s license was translated and inscribed in Russian. Travel arrangements were made. (Henry decided to take his college-aged son, Jed, along for support and companionship.) Well beforehand, I informed my contacts in Moscow, Leningrad and Kiev of his schedule. Expenses for the trip were covered by the CCSA. In June, Henry spent two-week in the Soviet Union, met productively with many teachers and students, and tested and certified 32 teachers in all.